Peas are pretty easy to grow. Just give them cool, spring weather, composted soil that drains well, and some climbing support. If you’re short on space, peas can be grown in containers, along walls, or trained up corn and sunflower stalks. Peas are one of the world’s oldest crops. Wild peas were foraged centuries before they were domesticated as the trellis climbers we know today. Peas were one of the first plants to be selectively bred by farmers, and were the key crop that Gregor Mendel used in the 1800s to figure out how plant genetics and hybridization worked. There are many heirloom and specialty varieties of peas available in garden catalogs. Peas come in two basic types: shelling peas and “snap” or “snow” peas. 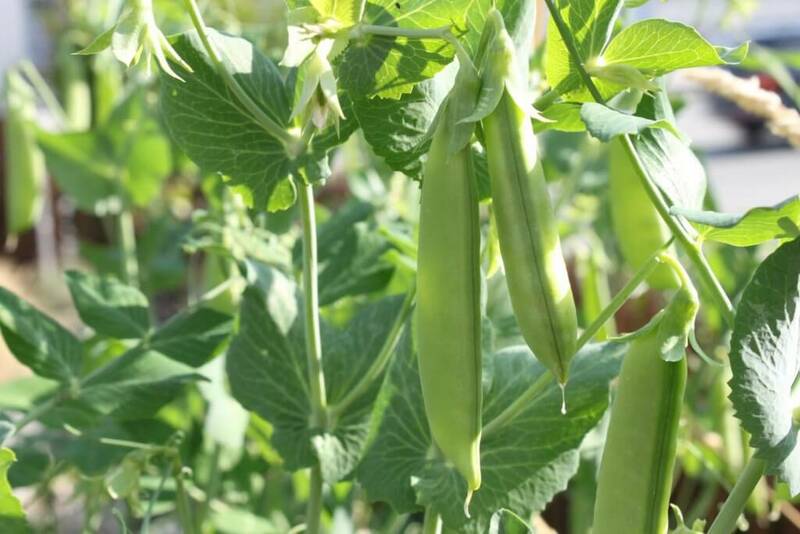 Both types need the same conditions for growing, but shelling peas do not have an edible pod and therefore the peas must be removed or “shucked” from the pod after harvest. In contrast, snap or snow peas are meant to be eaten whole, pod and all. Snap peas are usually thicker and broader than snow peas, and can often be sweeter, too. Many people prefer to grow snap and snow peas because they are less work at harvest, and you get the edible pod, too. Moisten a paper towel or cotton cloth. It should be damp, not soaking wet, so as to avoid fungal growth. Space the seeds about an inch apart on the towel and carefully roll it up. Place the moist towel into a plastic bag or a glass storage container. Since seeds need to breathe, do not seal the bag or container (leave the lid loose). Place the container in an area that is about 45-50 degrees F, which is optimal germinating temperature for peas. Check the moisture level daily and remove any seed which has formed mold. Sprout the seeds until they have just germinated to avoid breaking off any tender shoots, and then plant them in containers or directly into the garden right away. They are fragile at this stage, so they need to be handled with extreme care. One of the benefits of growing peas is that, as a member of the legume family, peas fix nitrogen in the soil which will help fertilize future plants. By rotating your peas every year into different parts of your garden, you can add nitrogen to your soil, year by year. Plant your pea seeds 1 inch deep (deeper if soil is dry) and 2 inches apart adding a little mycorrhizae innoculant to each hole as you go. I usually plant a double row that is 8 feet long, but only 6 inches wide, with over 100 plants. I grow them up a trellis net placed at the very back of the garden bed. This gives me a lot of food for the space in my garden, and enough peas for my family to eat fresh, canned, pickled or frozen all year. It is usually recommended that you put at least 2 seeds in each hole when planting, in case one of the seeds does not germinate. But if you pre-sprouted your seeds, you can carefully place just one seed exactly where you want it. Though adding compost or composted manure to the soil right before planting won’t hurt, peas don’t need fertilizer, which will reduce your harvest. When you water them, water the soil, not the plant, to discourage disease. The best way to combat pests and diseases in peas is to prevent them. Choose varieties of pea seeds that are resistant to the pests and diseases in your region, and plant peas in a different spot each year to minimize the risk of contracting or spreading infections. Also use drip irrigation to minimize the spread of disease via water droplets. Do not compost pea plants with fungal diseases or viruses. Many insects and their larvae find pea plants as delicious as we do. If your pea plants have been eaten down to the soil, cabbage maggots or cutworms are usually the culprits. Sprinkle wood ash around the base of the plants to prevent them. Aphids and thrips can deform the leaves or pea pods, so spray them with a non-toxic, insecticidal soap. Silvery webs on the undersides of leaves may be the work of spider mites, which can also be sprayed with insecticidal soap. Hand pick spotted cucumber beetles or armyworms to prevent them from chewing holes in leaves. Pea weevils emerge in spring and lay their eggs in your peas seeds. Once hatched, the larvae munch on the seeds, creating holes, wiping out most of your crop before they can even sprout. Insecticides are useless since the larvae can’t be affected; therefore, the adults must be eradicated. Using a garden fabric or row cover is one of the best ways to prevent pea weevils. Hand-pick the adults and remove their orange eggs from the plant leaves. You can also use wood ash or diatomaceous earth to to help control larvae and adults alike. Downy mildew, powdery mildew and fusarium wilt are common in peas. Yellowish or brownish spots on leaf surfaces may indicate downy mildew. Improve air circulation and drainage if you discover these symptoms, and keep your garden free of debris. Pick off infected leaves. Round, white spots anywhere on the plant are signs of powdery mildew. This often shows up late in the season but does not usually result in the loss of the plant. Pick off infected leaves. Fusarium wilt causes stunted and yellow plants. Fungicides are not effective in treating it; remove and destroy any infected plants. Aphids spread both mosaic virus and pea enation virus, which can cause brittle, deformed leaves and stunted plants or, in the case of pea enation virus, highly deformed pea pods. Neither virus can be cured. In the case of mosaic virus, infected plants will produce peas, but the size and yield will be reduced. Plants infected with pea enation virus must be destroyed. Controlling aphids may help, but choose disease-resistant hybrids next season for better insurance. Always pick peas in the morning after the dew has dried. They are crispiest then, and picking dry plants will reduce the chance of spreading any diseases. Always use two hands when you pick peas. Hold the vine with one hand and pull the peas off with your other hand. Keep your plants well-picked to encourage more pods to grow. When your peas are done growing once the weather warms up, just snip the stems off at ground level and let the roots decompose in the soil, leaving the nitrogen fixed into the roots for future crops. All types of fresh peas can be kept in the refrigerator for about 5 days. For long-term storage, you will need to freeze them or can them. You can also let them grow too long and then dry and store them, but I don’t recommend using snow or snap pea varieties for dry peas. A regular shelling pea is better for this.